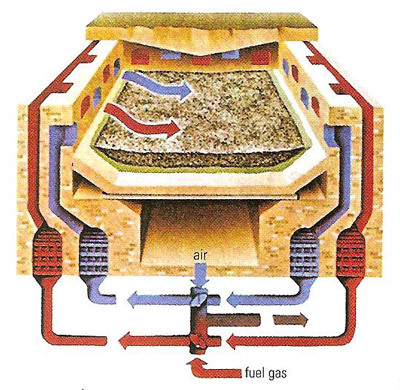 Siemens-Martin open-hearth process is an obsolete process for making steel in which streams of air and fuel gas were fed alternately onto the furnace contents. It was used to make most of the steel during the twentieth century but was then superseded by the basic oxygen and electric-arc methods. The open-hearth process used the gases from the molten charge to pre-heat the air blast and so economize on fuel. An alkaline lining was used if the ore contained phosphorus.